Around this time last year I was working on a Charlotte magazine article on Max Siegel, who at the time was president of Dale Earnhardt Inc. My series of interviews with Siegel were some of the best I've experienced during my career as a journalist. The reason I say this is because of the access he granted me. I asked if I could "shadow" him for a couple of days, follow him around DEI's offices and race shops in Mooresville, sit in on his meetings, and experience what his typical day is like (it moved at a hectic pace). At certain times during some of the meetings I attended, Siegel would ask me to turn off my recorder or say "this is off the record," basically letting me know what I was about to hear shouldn't be included in the article. It wasn't one of those situations in which he was trying to control the interview--he was instead very candid and forthcoming--but some of the discussions in the meetings were private business matters or included details that hadn't been finalized. One of those meetings was about Carowinds' interest to build a roller coaster dedicated to the late, great Dale Earnhardt. One of Siegel's primary responsibilities was to oversee this type of business venture--companies frequently approach DEI with propositions to attach themselves to Earnhardt's lucrative brand (he's like the Elvis of NASCAR). Carowinds' proposal to build an Earnhardt roller coaster was in its early stages at the time. Well, it appears that DEI liked it because they've signed off on the licensing, paving the way for The Intimidator roller coaster, set to debut next spring as was announced by Carowinds yesterday. The Intimidator will be the Southeast's tallest, fastest, and longest roller coaster, standing 232 feet (23 stories) tall at its highest peak and reaching speeds in excess of 75 miles per hour. The 5,316 feet of track will feature high-speed twists and turns including seven steep drops--one for each of Earnhardt's NASCAR championships--and it's intended to replicate the speed and intensity of a NASCAR race. The trains on The Intimidator will be designed to mirror Earnhardt's 1998 Richard Childress Racing No. 3 Chevrolet Monte Carlo. The roller coaster is projected to cost $23 million to build. Below is a video simulation of The Intimidator roller coaster. 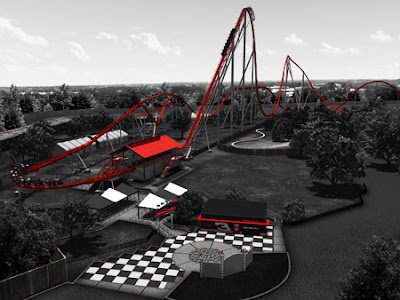 For more details, visit www.intimidator.carowinds.com. As for Siegel, he left DEI after the company merged its racing operations with Chip Ganassi Racing late last year. He's since started a marketing firm called The 909 Group, based in Huntersville, and continues to work with NASCAR along with other major sports and entertainment clients.